Apple on Monday released its expected Final Cut Pro X 10.4.1 update, introducing a new video format —ProRes RAW —and improved closed captioning support. ProRes RAW is said to offer the quality and workflow advantages of RAW coupled with the performance of Apple's ProRes. Under the combined format, editors can import, edit and grade footage with RAW data from the camera sensor, making it ideal for HDR workflows. Editors can also play full-quality 4K ProRes RAW files on 2016 and 2017 MacBook Pro or 2017 iMac systems in real time, without rendering. ProRes RAW files are even smaller than ProRes 4444 files, enabling better use of storage while providing an archival format. Final Cut editors can work natively with ProRes RAW and ProRes RAW HQ files created by Atomos recorders. The format will be available as a free update for owners of Atomos Sumo 19 and Shogun Inferno devices. The format will likewise be available as part of a forthcoming upgrade package to users of the DJI Inspire 2 drone and Zenmuse X7 Super 35mm camera system designed for aerial cinematography. 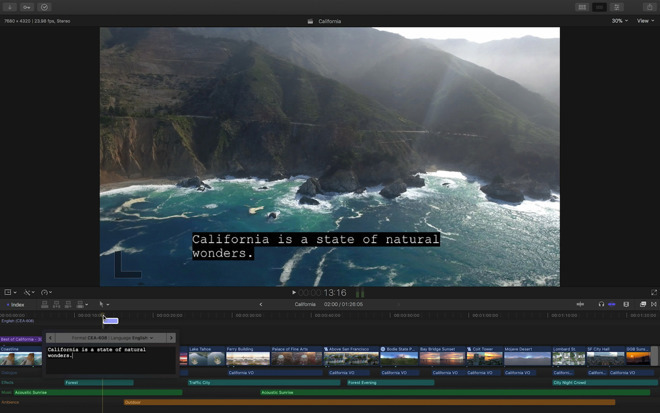 Users can import closed captioning files directly into a project, or build them from scratch. Captions appear in the viewer during playback and can be attached to video or audio clips in the timeline. A new captions inspector makes it simple to adjust caption text, color, alignment, and location. Captions can be created in multiple languages within the same timeline, and users can easily share captioned videos to YouTube and Vimeo. The 10.4 update to Final Cut Pro X was made available on Dec. 14, with new features including editing full-resolution 8K video, and the extension of 360-degree VR video support to Motion and Compressor. The latest version of Final Cut Pro X requires macOS 10.12.4. Final Cut Pro 10.4.1 is free for existing users, and $299.99 for new users on the Mac App Store. Motion 5.4.1 and Compressor 4.4.1 are also available today as free updates or $49.99 each. Apple's educational bundle containing Final Cut Pro, Motion, and Compressor is $199.99.